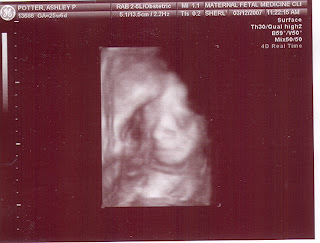 Here is the latest ultrasound picture. Each picture is getting clearer and clearer, and as I get further along, I will be able to see more and more what she looks like. I have mixed feelings about this. I have already taken a huge element of surprise out of the childbirth equation by finding out the gender, and now if I actually see what she will look like then there isn't much room for surprise. However, I might be too far into the process to stop the 3 & 4D pictures from coming! I'll have to think some more on that one! My weekly ultrasound yesterday didn't reveal much change (which is good). My cervix is back to 6.6 mm or .6 cm. I have been fluctuating within a few millimeters but I always seem to come back to the 6 mark. For those of you who don't know, a normal cervix is about 4 cm, and a woman in my stage of pregnancy should still be between 3-4 cm. Typically, a woman with my size cervix is experiencing pre-term labor and will soon start to dialate and efface meaning she could start active labor at anytime. Thankfully, I have a cerclage. A cerclage is a set of stitches that are sewn around the cervix and closed like a purse string. This keeps the cervix from opening prematurely (dialating). So if it weren't for the cerclage, I would be in a world of trouble. So, I will keep doing what I'm doing and hope that I can bide some more time. You have a way with words! I was reading your blog on choosing a name and almost started crying (okay, I still have mommy-hormones from pregnancy, or maybe it never goes away after having children?). You should consider being an author, if you aren't one already (maybe this is considered authordom). Love your stories and pictures. You are inspiring me to keep a journal! Don't stop the untrasound pics!! You have more than yourself to consider ... I'm hooked on the pics, too! !